You can easily scale it for high message rates, but it's primarily a flow-monitoring tool rather than an APM. Autopilot is a middleware-centric business transaction monitoring tool that includes a Complex Event Processor (CEP) for transaction data. AutoPilot Probes are lightweight performance measurement and monitoring tools for live applications that are executed at defined points within the transaction processing network. The Probes intercept transaction-related data, response time, and exceptions for activities initiated from applications. Probes then publish the collected data to the Analyser. 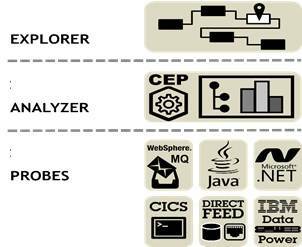 There are numerous probes available, including: a WebSphere MQ and Message Broker probe and a Java probe used to track Java applications and web sessions (JSP/servlets, Java method calls, JDBC, JTA, Weblogic and JBoss application servers). There is also a .NET probe, a z/OS probe, an IBM DataPower probe and a Direct Feed probe capable of capturing transaction data from a variety of sources, including log files and data streams. The AutoPilot Analyser collects the transaction-related data published by the Probes, analyses the data in real-time, and publishes summary information to the CEP in the form of "facts". These "facts" are bits of information formalized as name/value pairs and organized in a hierarchical structure exploitable by the CEP engine. The facts exposed by the Analyser are recorded in a database and used by the CEP engine for "stitching" transactions and message flows. The CEP engine allows collection, filtering, sorting and aggregating of various events and metrics in real-time. The above image shows that CEP engine is conceptualized as a "pipeline" through which a stream of events flows. Rules and contextual analysis are used to detect specific sequences of events. When compound events are detected, the CEP can initiate actions (analytics, events, notifications). For example, AutoPilot can perform an automated action, trigger a notification (alert) or forward an alarm to an Enterprise Systems Management (ESM) tool. Visualisation is via the thick client M6 Console or AutoPilot Explorer, a web application that provides multiple graphical views of transaction processing. The graphical views include a Summary View, which shows overall transaction processing metrics; a Statistics View, which shows statistical analysis for selected transaction components at selected execution times; a Trace View, which shows transaction flow diagrams and the transaction trace table, listing every individual operation that was observed by all the transaction probes. It can easily extract information from the most common middleware products on the wire. The CEP is good, and it's capable of making decisions in microseconds. The GUI can be delivered on a thick client or as a web app. You can easily scale it for high message rates. It provides a drill-down and examination of individual transactions. The GUI is quite basic and middleware-centric. The company does not have much of a presence outside of the US. It is primarily a flow-monitoring tool rather than an APM. Download our free Application Performance Management (APM) Report and find out what your peers are saying about Nastel Technologies, AppDynamics, CA Technologies, and more!